MENLO PARK, Calif., Jan. 24, 2019 /PRNewswire/ — Employee absenteeism after major sports events like the Super Bowl is on the rise, suggests new research from staffing firm OfficeTeam. More than half of professionals (54 percent) know someone who’s called in sick or made an excuse for skipping work following a big game. That’s up from 41 percent three years ago. 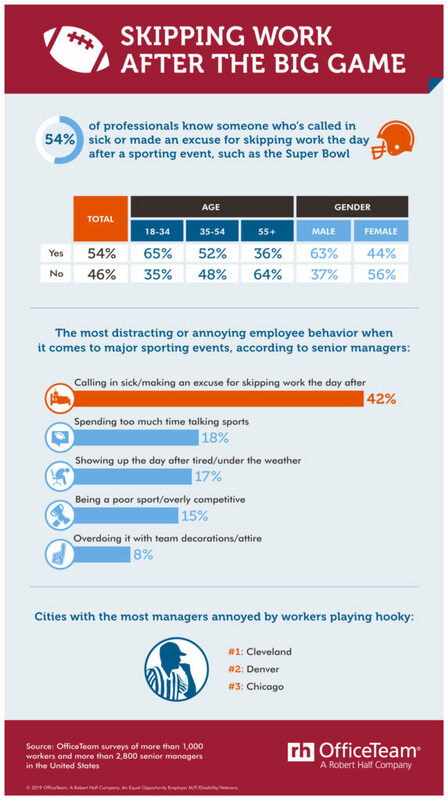 In a separate survey, senior managers identified playing hooky the day after (42 percent) as the most distracting or annoying employee behavior when it comes to sports, a 20-point jump from a similar survey in 2017. According to a new OfficeTeam survey, more than half of professionals (54%) know someone who’s called in sick or made an excuse for skipping work following a big game. See additional stats on sports events and work here: https://www.roberthalf.com/blog/management-tips/skipping-work-after-the-big-game. Professionals ages 18 to 34 (65 percent) most often said they know someone who’s played hooky following a major sports event, compared to those ages 35 to 54 (52 percent) and 55 and older (36 percent). Sixty-three percent of male employees admitted the same, versus 44 percent of women.